It’s Pi day! And no, I didn’t spell that wrong. Today is 3/14, the first 3 numbers for Pi. The Greek letter that is a symbol in mathematics to represent a constant – the ratio of the circumference of a circle to its diameter. It’s an irrational and transcendental number, i.e. it will go on infinitely without repetition or a pattern. Have I bored you yet? Sorry… On to the Pie. 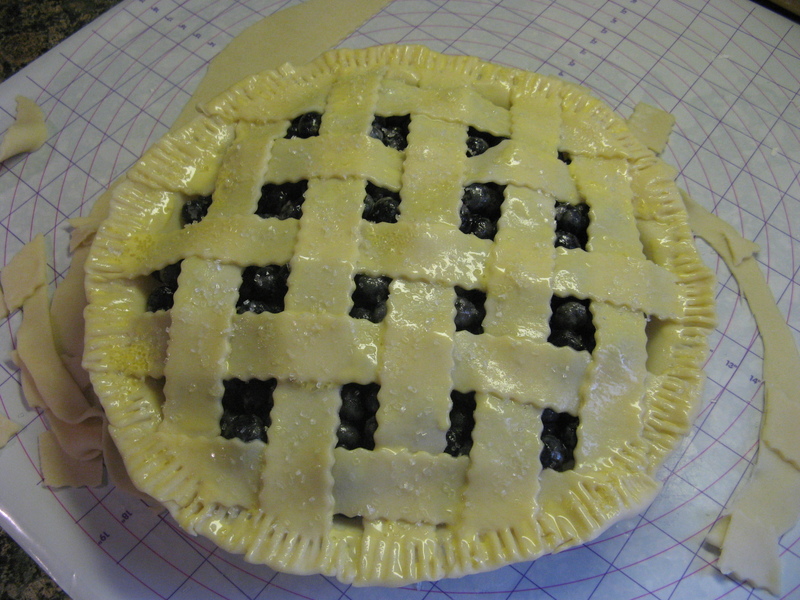 In honor of Pi Day, I decided to bake a pie I had never had before, a blueberry pie. 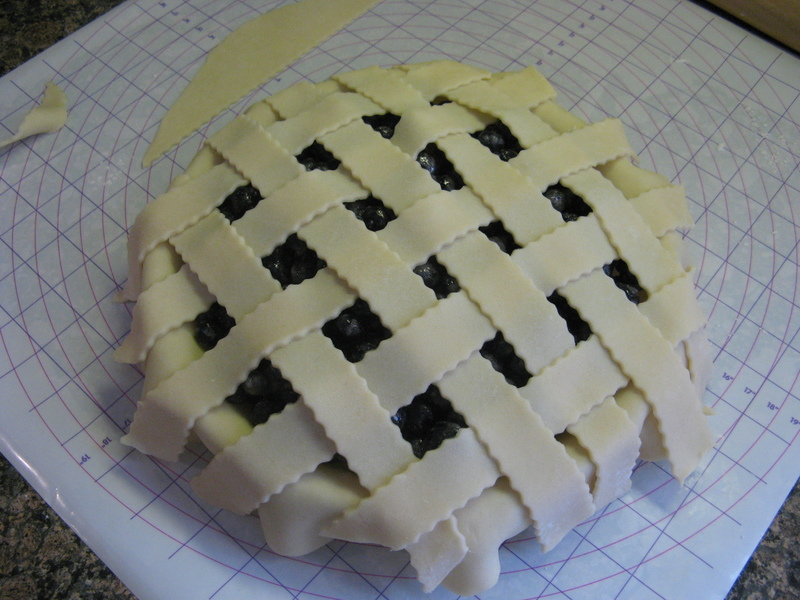 A Lattice-Top Blueberry Pie to be exact. 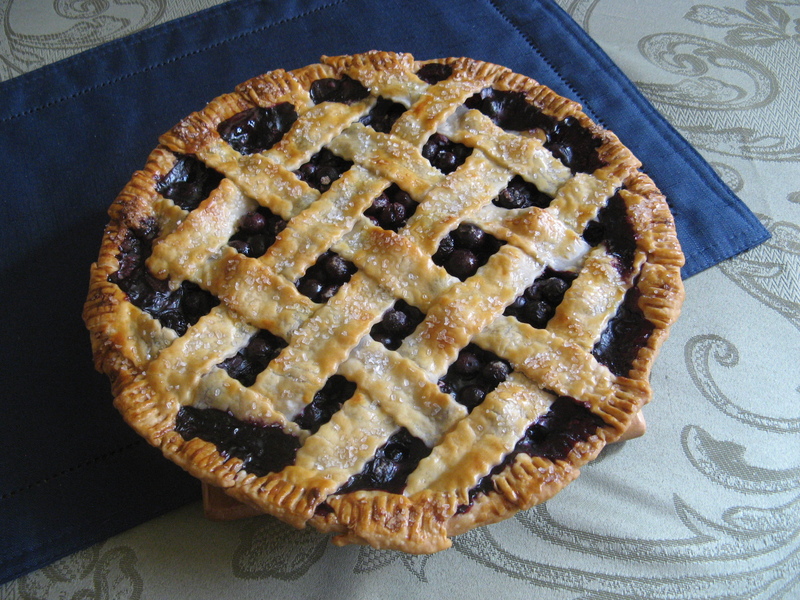 Yes, I never had Blueberry Pie until I made this one. I must say, I am not a big pie eater, especially fruit pie. I always feel like they are going to be super sweet. What made this pie a hit amongst those who tried it was the fact that it wasn’t super sweet. Something I was quite happy about as well. I’m not a fan of making pie crust from scratch so I buy Pillsbury refrigerated crust. I find it works just as well as homemade crust – I am sure there are plenty of you shaking your heads at that comment right now – and its super easy to use to make a decorative crust. And another plus, clean-up is a cinch! So after letting my two crusts (one for the top and one for the bottom) come to room temperature I rolled out what would be the bottom into a 13 inch round; the crust was already a 9-inch round so I had no problem rolling it out the extra few inches. I then fitted it into my 9-inch pie plate. Next, I made the filling. I combined 7 cups of fresh blueberries with sugar, cinnamon, cornstarch & lemon juice. I then poured the mixture into the pie plate. 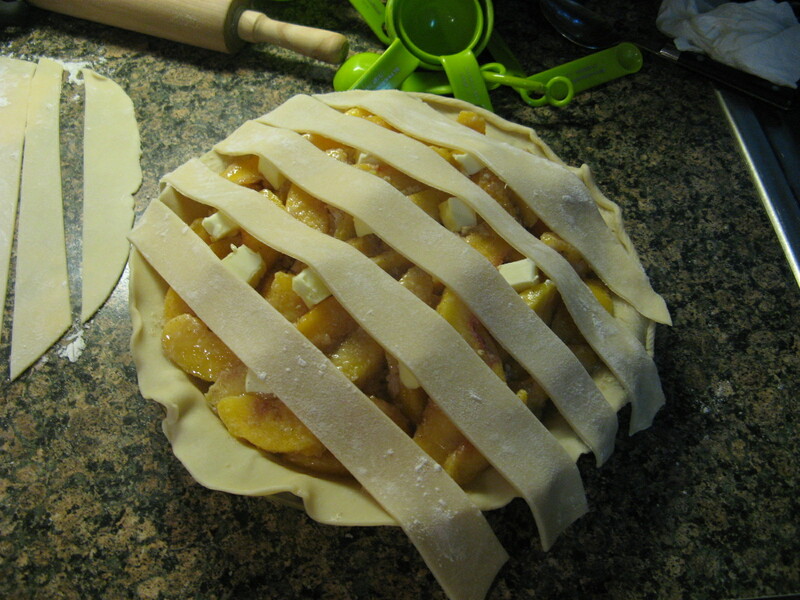 To make the lattice top, I started by rolling out the other half of the pie crust into another 13-inch round. 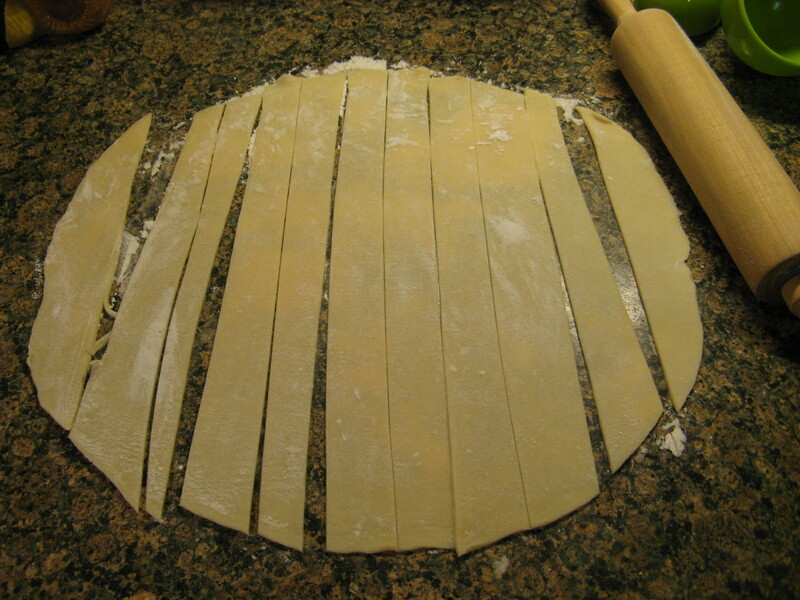 Then using a fluted pastry wheel I cut the dough into ten 1-inch strips. Thankfully my work mat has 1-inch grid lines on it so cutting out the strips was a breeze. I just had to be sure to cut in a straight steady line. I placed five of the strips vertically on the pie, evenly spaced. And then proceeded to fold and unfold the strips to create a lattice pattern. 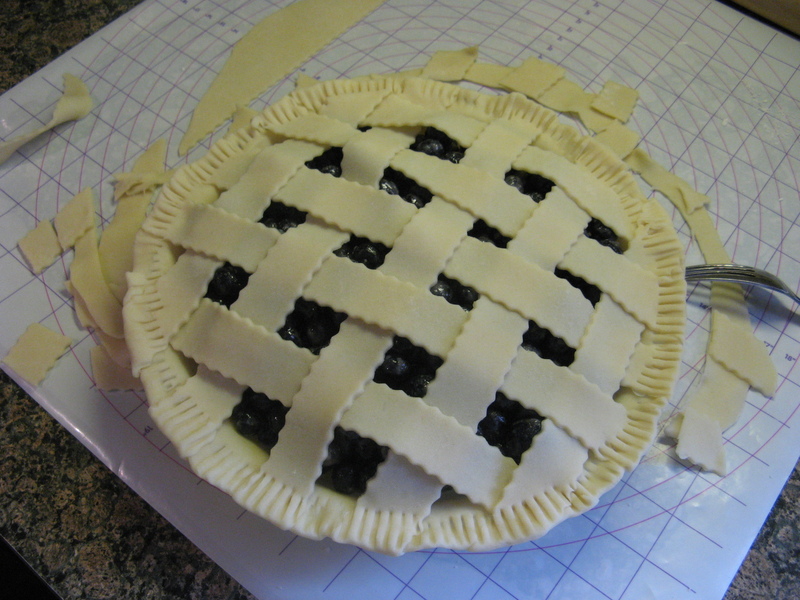 I then trimmed and tucked in the edges of the crust and crimped it with a fork. 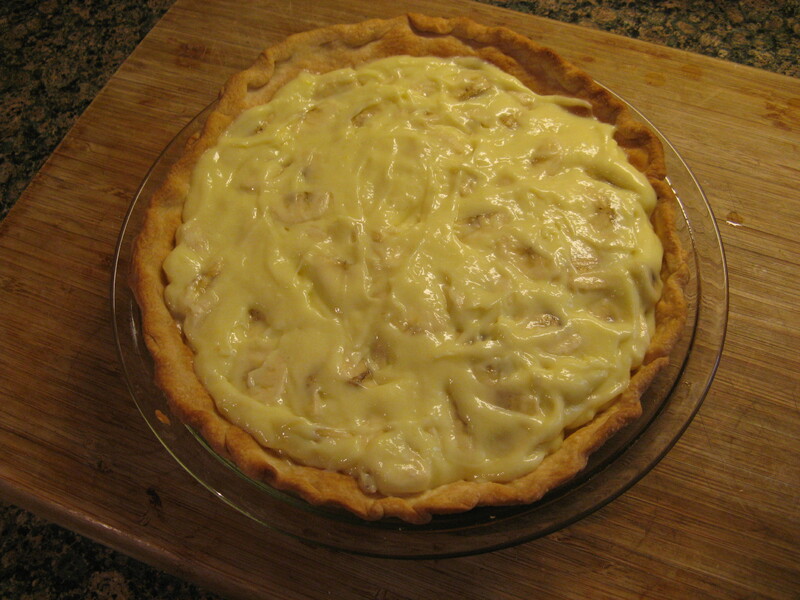 Next, I brushed the pie with an egg yolk-heavy cream egg wash and sprinkled sanding sugar on top. And after refrigerating the pie for about a half hour in the fridge I placed it on a parchment lined baking sheet and baked it in a 400 F preheated oven for about 20 minutes, until the crust began to brown, and then lowered the oven to 350 F and continued baking the pie for about another hour, until the crust was a deep golden brown and the juices began to bubble. I kept the pie tented with aluminum foil for most of the baking time, removing it for the last 30 minutes of baking so the crust wouldn’t brown too quickly. On a lightly floured surface roll out half of your pie crust into a 13-inch round about 1/8-inch thick. 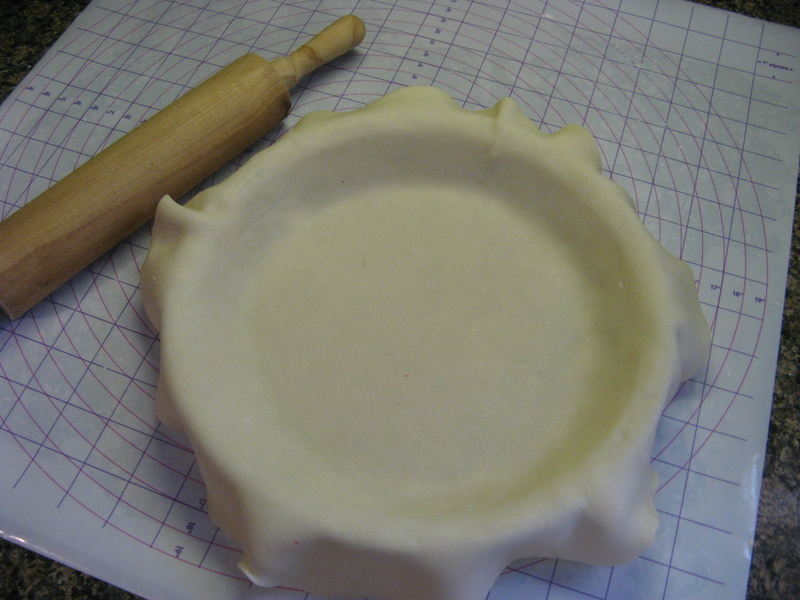 Fit dough into a 9-inch pie plate. 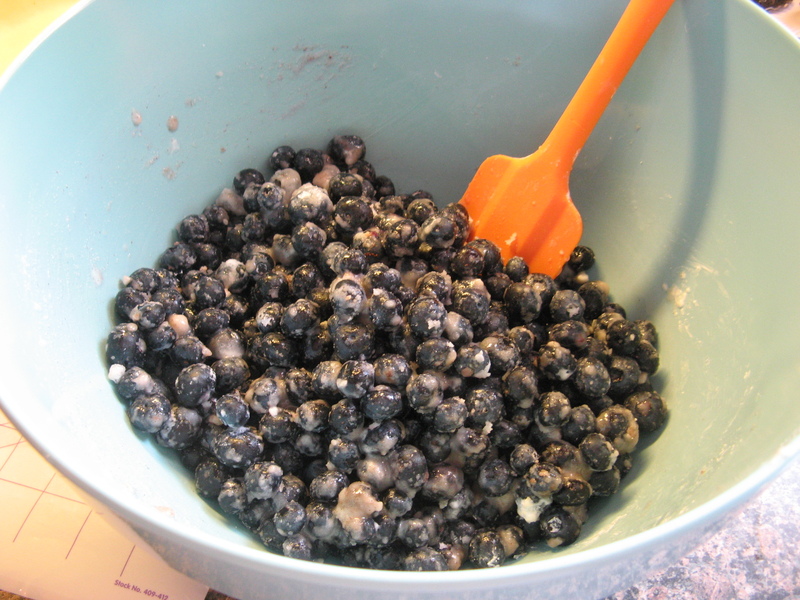 In a large bowl combine the blueberries, sugar, cornstarch, cinnamon and lemon juice. Pour the mixture into the pie plate, piling in the center. On a lightly floured surface roll out the other half of your pie crust. Once again into a 13-inch round about 1/8 inch thick. 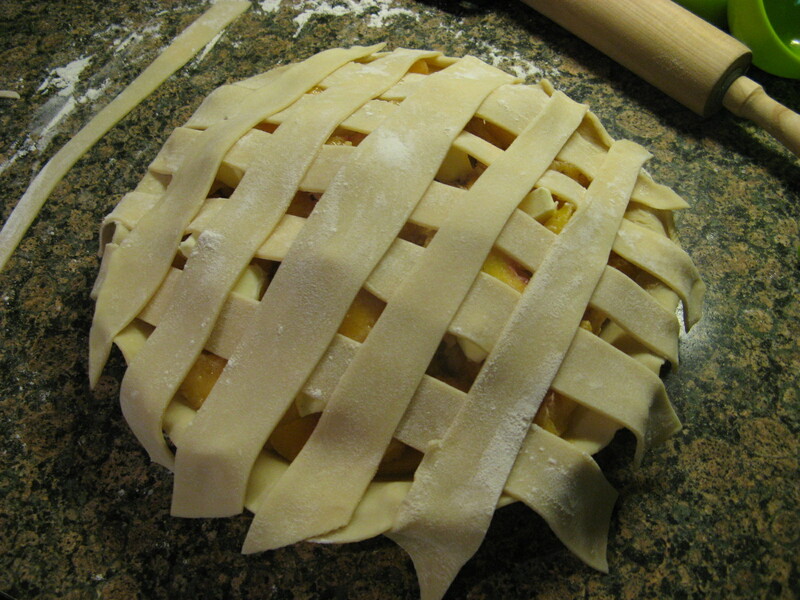 To make the lattice, cut the dough into 10 1-inch strips using a fluted pastry wheel or a pizza cutter. 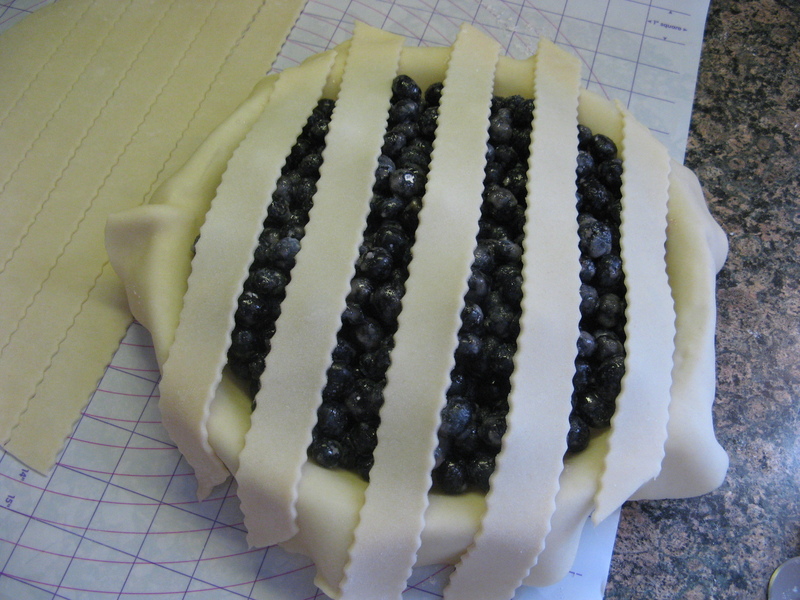 Carefully place the strips on the pie weaving into a lattice pattern. 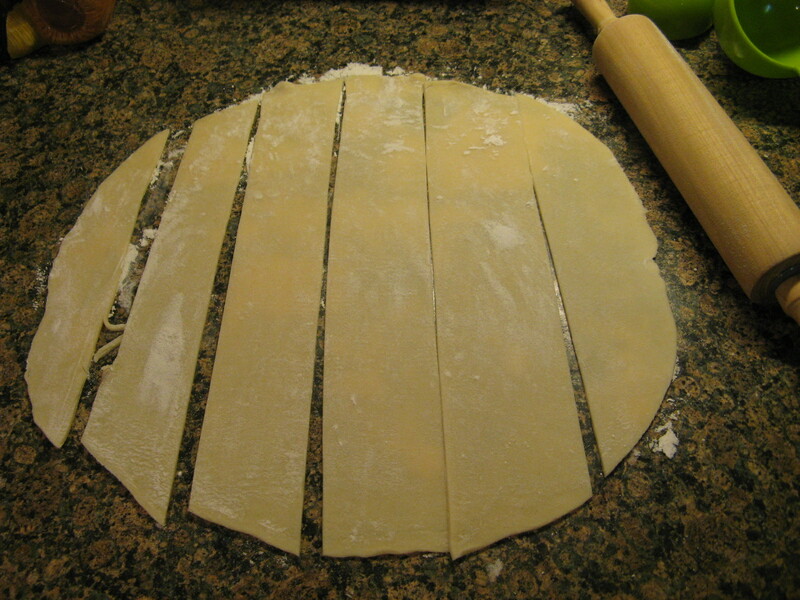 Trim the dough to a 1-inch overhang and fold the edges under, then crimp with a fork. 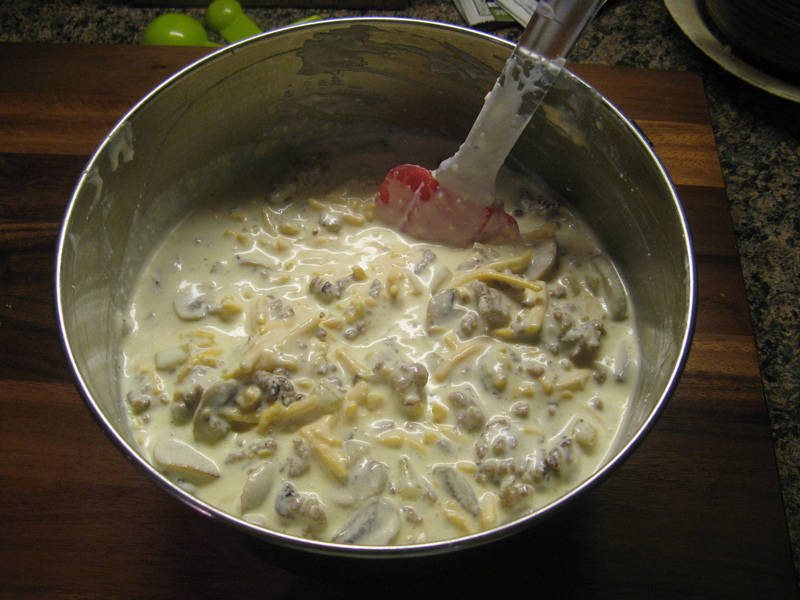 In a small bowl whisk together the egg yolk and heavy cream for the egg wash. Brush on top of the dough strips and then sprinkle with the sanding sugar. 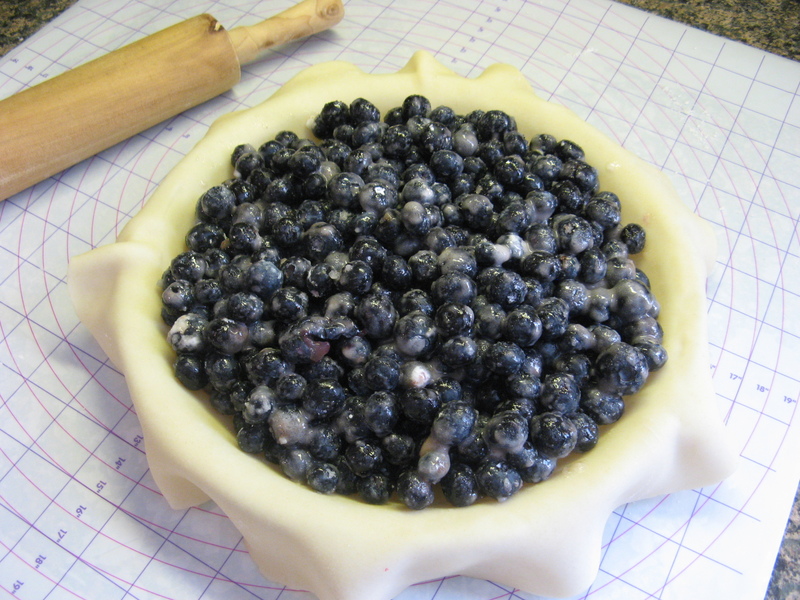 Refrigerate or freeze the pie until firm, about 30 minutes. 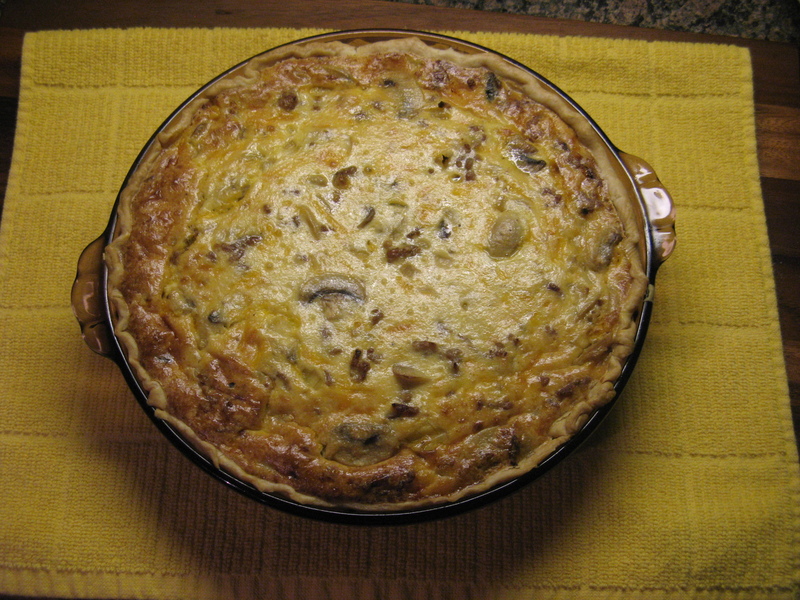 Place the pie on a parchment lined rimmed baking sheet and bake until the pie begins to brown, about 20 minutes. Reduce the heat to 350 F and continue baking until the crust is a deep golden brown and the juices begin to bubble, about an hour. If the crust begins to brown too quickly tent the pie with aluminum foil. Transfer to a wire rack to cool completely before slicing in. A few weeks ago I posted about a Tomato Fontina Torte with Rosemary Crust that was quite delicious. I got the recipe from a recent issue of Food Network Magazine, well, when I went to put the recipe back into my recipe binder (I’m one of those super-organized individuals) I noticed another recipe that I must have overlooked when I flipped through the magazine, a recipe for a Tomato and Corn Custard Pie that I knew I had to try and finally got around to it earlier this week. It ended up being the perfect combination of sweet and savory. To begin I baked the pie crust. I wish I had used my crust cover while baking the crust so it wouldn’t have browned as much during the final cooking with the actual pie in it. While the crust was in the oven I prepped all of my ingredients. 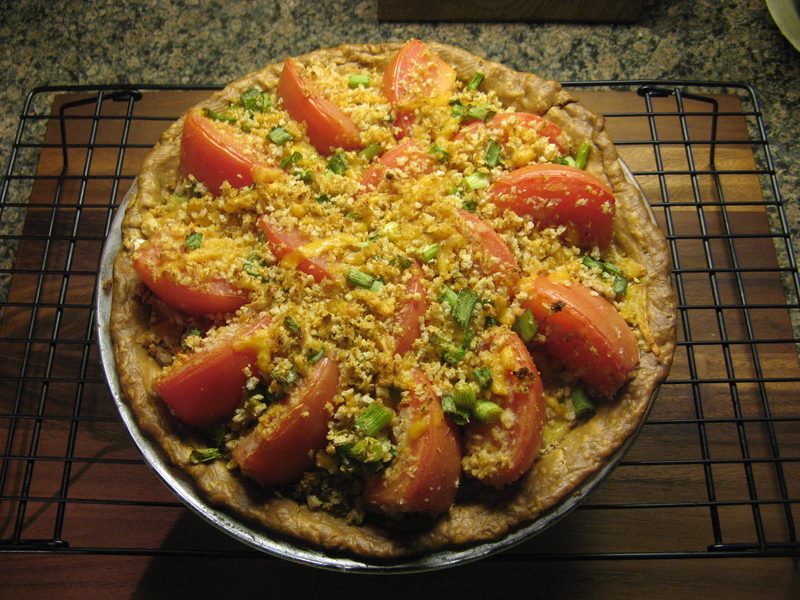 I began by coring the tomatoes and slicing them into quarters. I then tossed them with kosher salt and spread them on a paper towel lined baking sheet so they could release their juices. 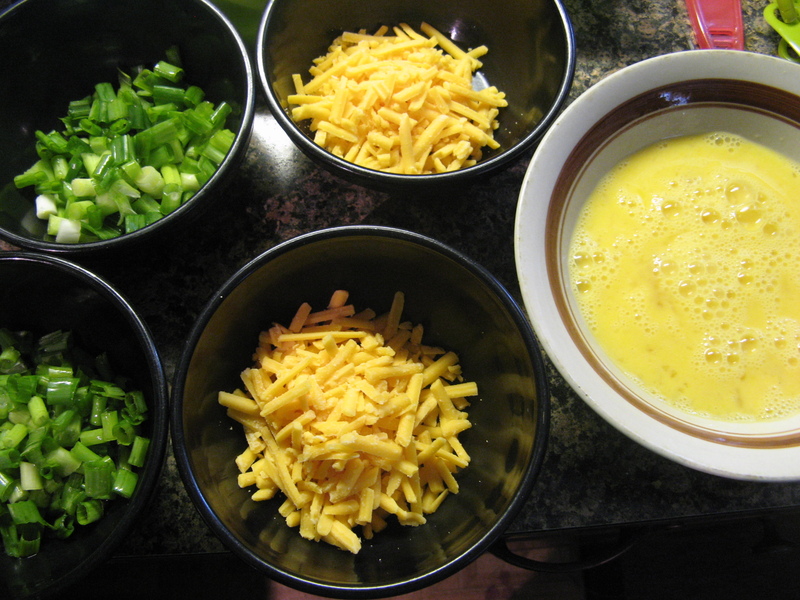 Next I chopped up 6 scallions and divided them into two bowls and lightly beat three eggs. 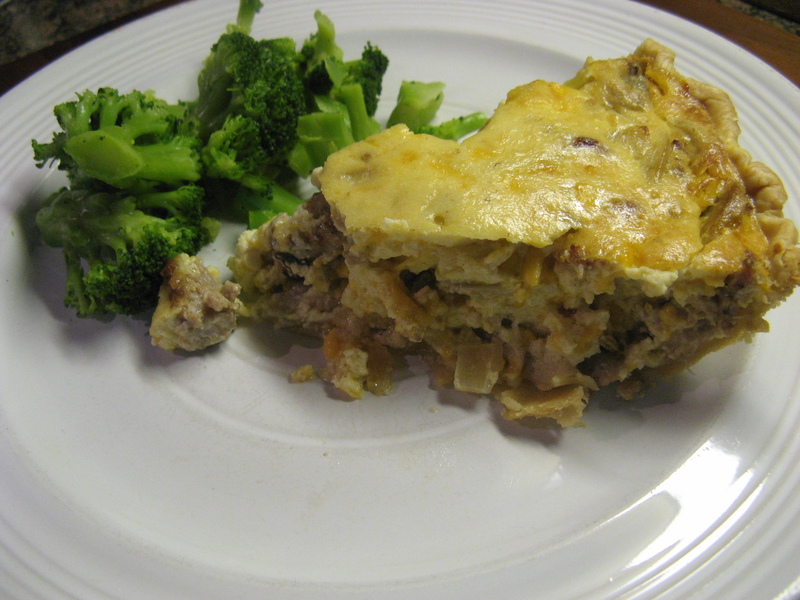 I took two major shortcuts for this recipe… I used pre-shredded sharp cheddar cheese and instead of using fresh corn I opted to use frozen corn that I steamed in the microwave. Following that I reserved 1/2 cup of the cooked corn in a large bowl and placed the remaining corn, about 1 1/2 cups, in a sauté pan with heavy cream and brought it to a simmer on medium heat. I then poured the mixture into the bowl of my food processor and blended it until it was smooth. 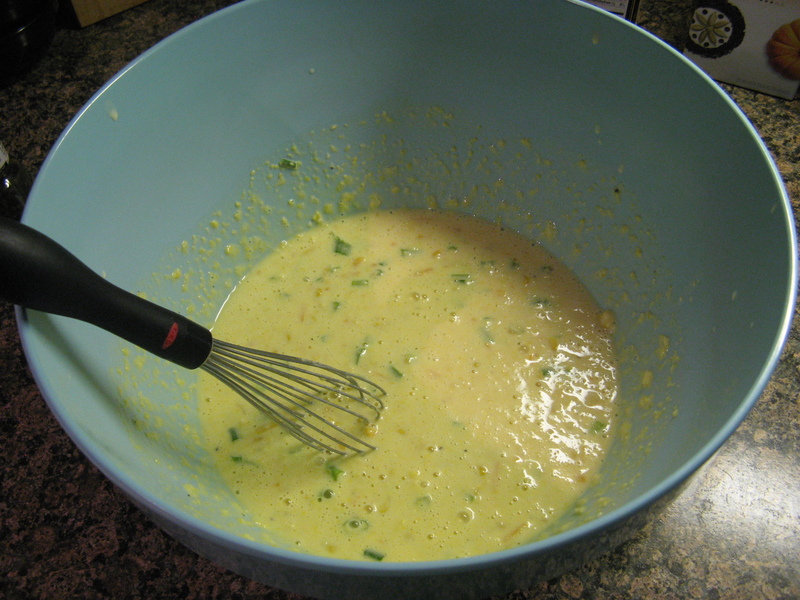 I transferred the pureed corn-heavy cream mixture to the bowl with the reserved corn and whisked in the eggs, half of the cheese and scallions and some fresh ground black pepper. I poured this mixture into my cooked pie crust and placed it in a 350 F oven for 35 minutes until it was just set. While the custard was cooking in the oven I mixed the remaining scallions and cheese along with panko breadcrumbs and seasoned it with paprika, salt and pepper. I reserved 1/4 cup of the mixture and tossed the remaining mixture with the tomatoes. 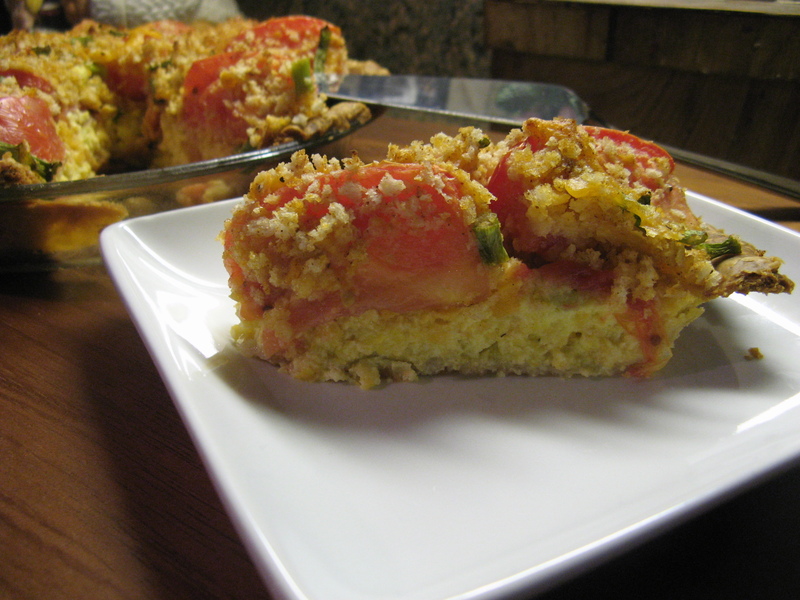 And then topped the pie with the reserved mixture and placed the coated tomatoes on top of the pie and topped it with the remaining panko mixture left in the bowl. Finally I dotted the top of the pie with a tablespoon of butter. I placed the pie back in the oven for another 15 minutes, until the top was golden, and let it cool for a bit before slicing into it. Final verdict… Absolutely delicious! The custard is a tad bit sweet because of the corn and the panko breadcrumb topping is on the savory side because of the addition of the scallions, paprika and cheddar cheese. This is a definite winner I can see myself making many times to come! 1. Position racks in the middle and upper third of the oven and preheat to 350 F. Line a 9-inch pie plate with the dough, crimping the edge with your fingers. Poke the bottom of the crust all over with a fork. 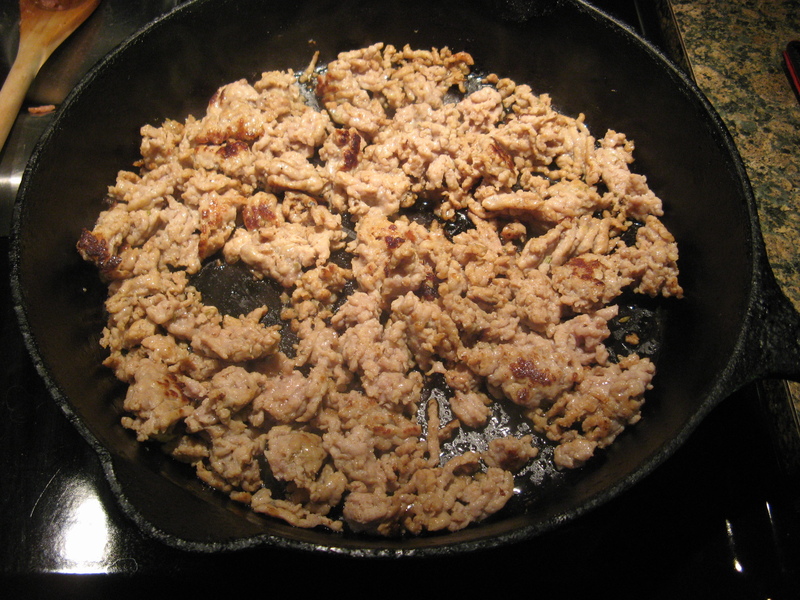 Line with foil and fill with pie weights or dried beans. Bake on the middle rack until golden around the edge, about 20 minutes. Remove the foil and weights; continue baking until golden all over, about 10 more minutes. 2. 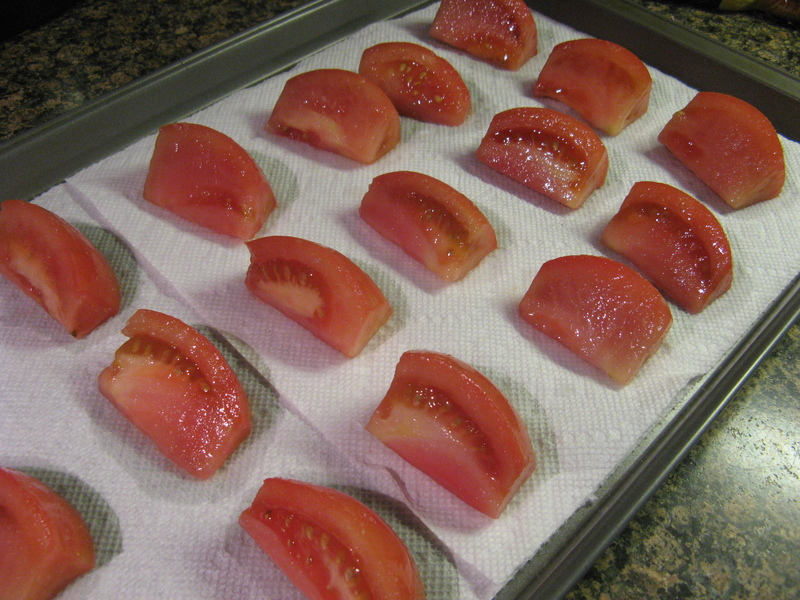 Meanwhile, core the tomatoes and cut into 1/2-inch wedges; toss with 1 1/2 teaspoons salt. 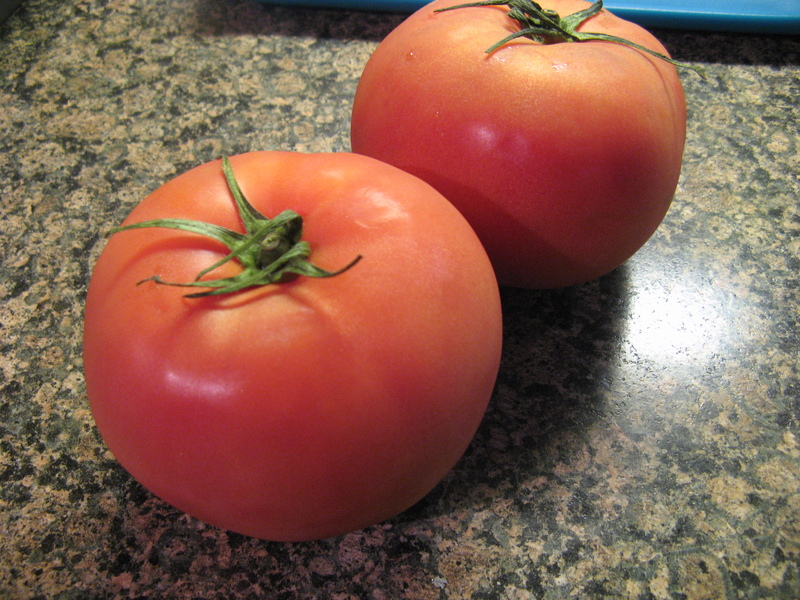 Spread the tomatoes in a single layer on paper towels to drain until ready to use. 3. 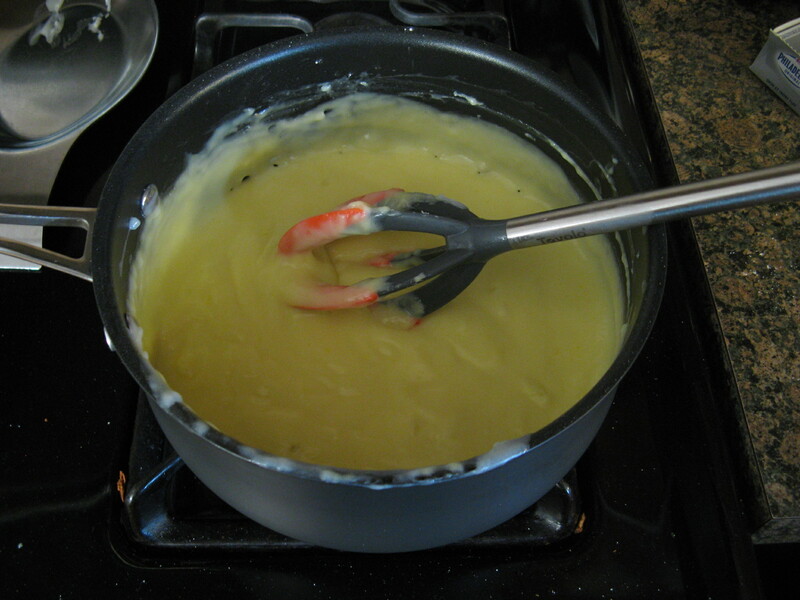 Melt 1 tablespoon butter in a medium saucepan over medium heat. 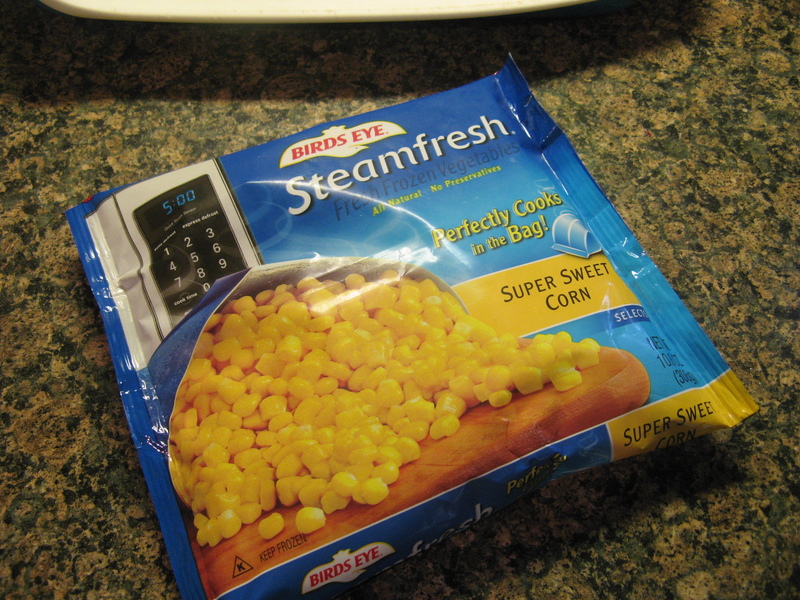 Add the corn and cook stirring occasionally, until tender, about 5 minutes. Transfer 1/2 cup of the corn to a large bowl. 4. 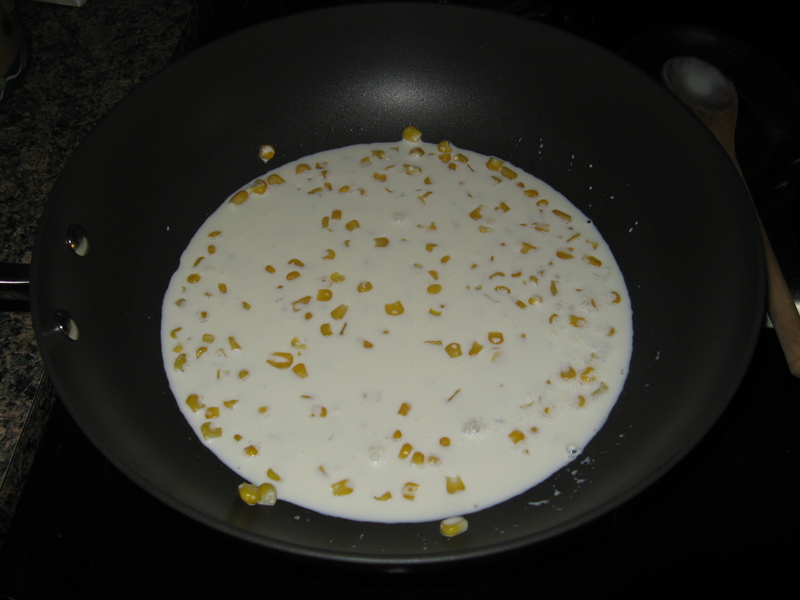 Add the heavy cream to the saucepan with the remaining corn and bring to a simmer. 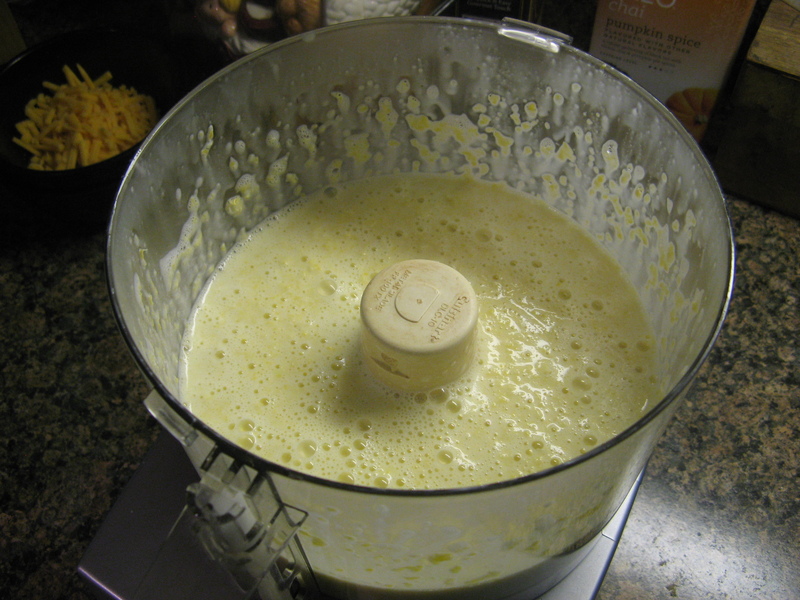 Carefully transfer the mixture to a blends and puree until smooth; transfer to the bowl with the corn. 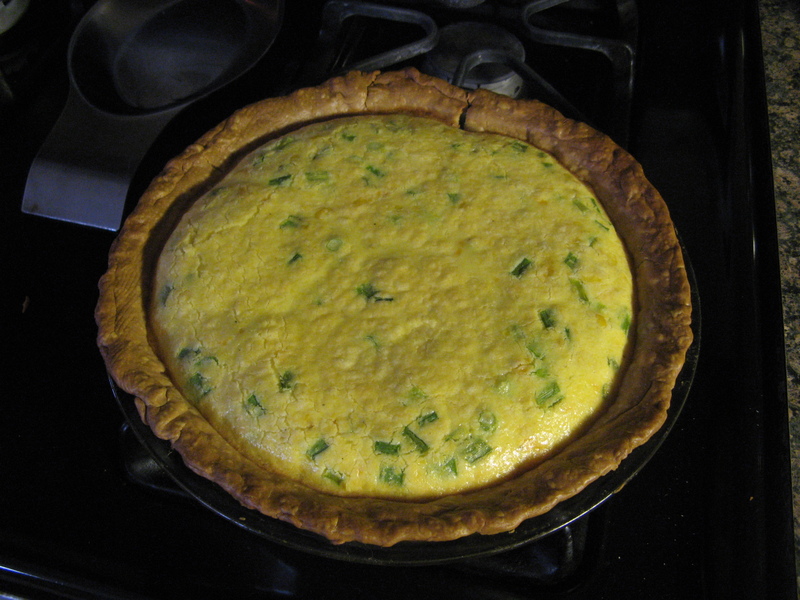 Whisk in the eggs, half each of the scallions and cheese, and a few grinds of black pepper; pour into the crust. Bake of the middle rack until the custards is just set, 35 to 40 minutes. Remove from the oven and increase the temperature to 400 F.
5. 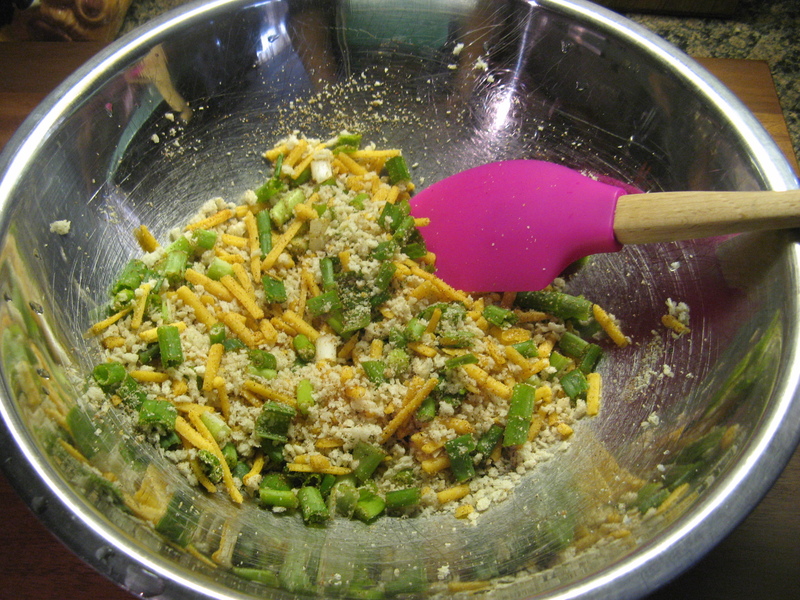 Mix the remaining scallions and cheese, the panko, thyme, paprika and 1/4 teaspoon each salt and pepper in a bowl. Sprinkle 1/4 cup of the mixture on top of the pie. 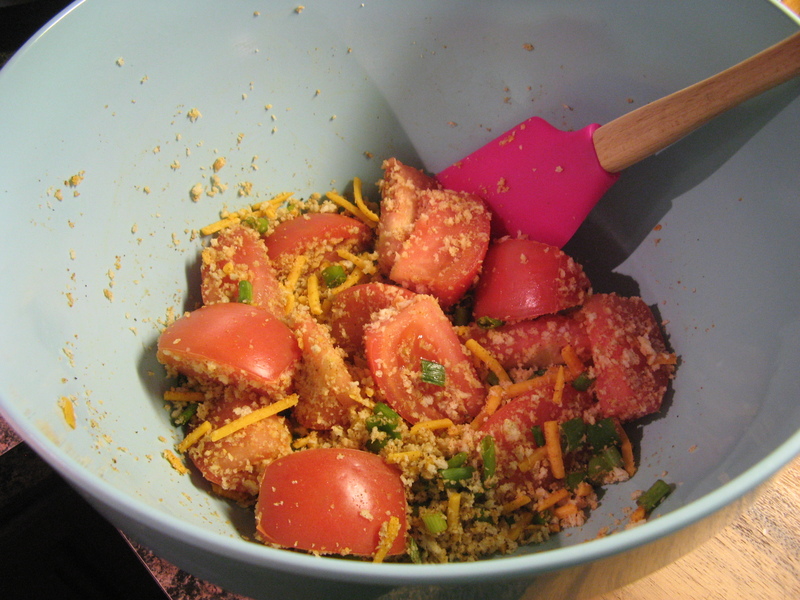 Pat the tomato wedges with paper towels to absorb the excess moisture, then coat with the remaining panko mixture and arrange on top of the tart. Sprinkle any remaining panko on top; dot with the remaining 1 tablespoon butter. Return to the oven on the upper rack and bake until the top is golden, about 15 minutes. Let cool 30 minutes before slicing. Short-cuts aren’t always a bad thing. When you are driving they can get you where you have to go quicker and hopefully help you avoid some traffic along the way. In our day-to-day lives they can make us a bit more efficient to get daily tasks completed. And in baking they can guarantee us a flakier crust and fruit that’s perfectly ripe for a pie! A few weeks ago I got it in my head that I wanted to make a peach pie. 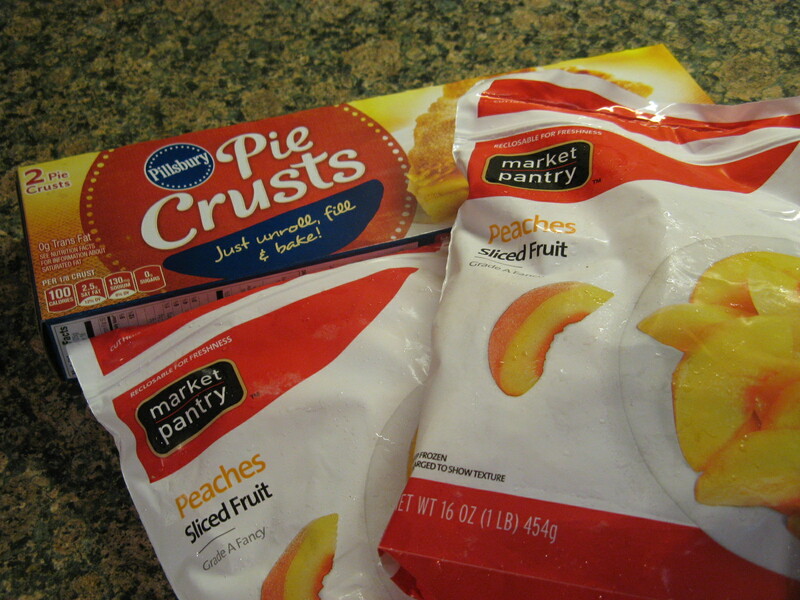 I’m actually not a big fruit pie fan – I’m not that keen on fruit pie filling, especially when it’s on the runny side – but, I think the Pillsbury Pie Crust sitting in my refrigerator got me thinking. I’ve made pie crusts from scratch once or twice before but, like I said there’s nothing wrong with taking a short-cut every now and then. I went one step further with my short-cut and opted to use frozen peaches. I just wasn’t in the mood to peel and slice a few pounds of peaches. I combined 2 pounds of frozen sliced peaches with sugar, flour, lemon juice, cinnamon, allspice and almond extract. I decided on the almond extract after reading that many bakers used to add the nut – sometimes called a “bitter almond” – that’s inside the pit of the peach to the pie while baking to give it an almond flavor. That practice has since diminished as it was discovered that the nut contains trace amounts of cyanide, granted you would have to eat a large quantity of them for anything to happen, but, who wants to bite down on something hard when they are enjoying a piece of pie. 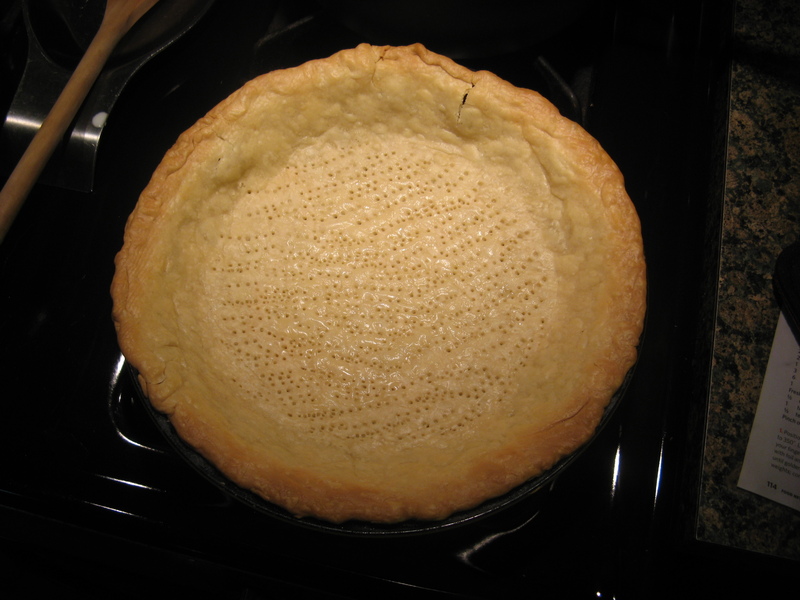 Next I unrolled one of the pie crusts and pressed it into the bottom of the pie dish. 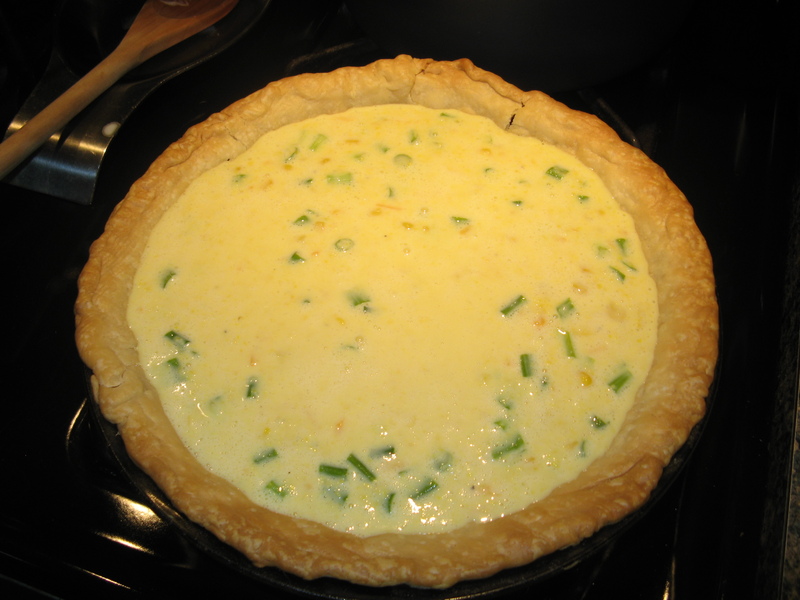 I then added the filling and mounded it slightly in the middle and dotted it with small pieces of unsalted butter. And then divided those strips in half to end up with a total of 12 1/2-inch strips. Then I laid four strips across the previous strips diagonally. And after some trimming and crimping, voila, a simple lattice pattern. I then placed the pie on a baking sheet in a 400 F preheated oven for about 25 minutes. I then lowered the oven to 375 F and baked the pie for about another hour. 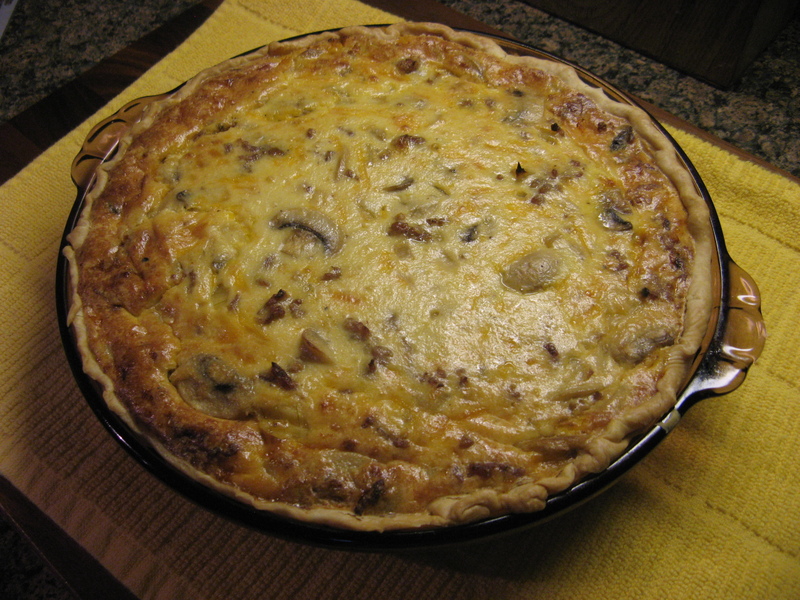 Prior to lowering the temperature I brushed the top of the pie with an egg wash to ensure a nice golden brown color. I kept a close eye on the pie and when I noticed the rims of it were browning a tad bit too much I covered it with aluminum foil. I knew it was time to take the pie out of the oven when the filling was bubbling. 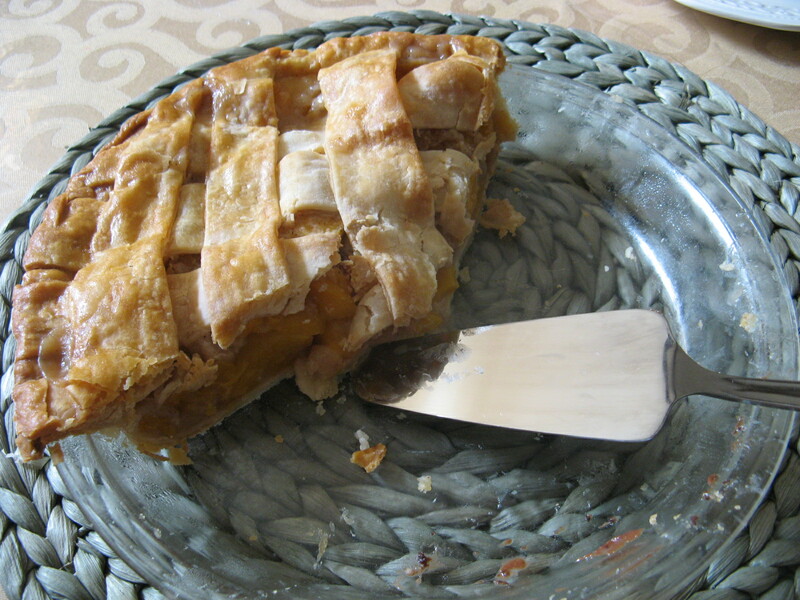 And I happy to say that the pie was a perfect consistency… Not too watery and not too dry! It was a definite winner! 2. Make the filling by mixing the peaches in a large bowl with the sugar, flour, lemon juice, cinnamon, all spice and almond extract. 3. 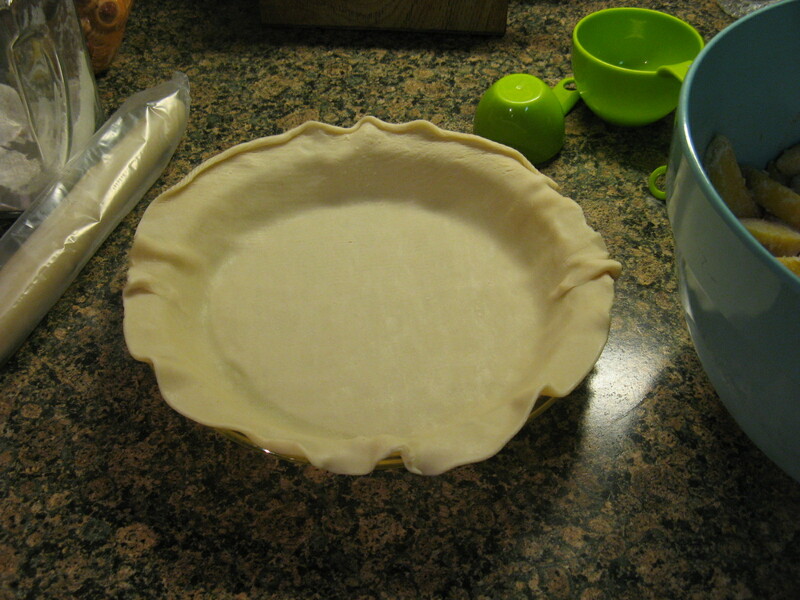 Unroll one pie crust and place in an ungreased 9-inch pie plate. 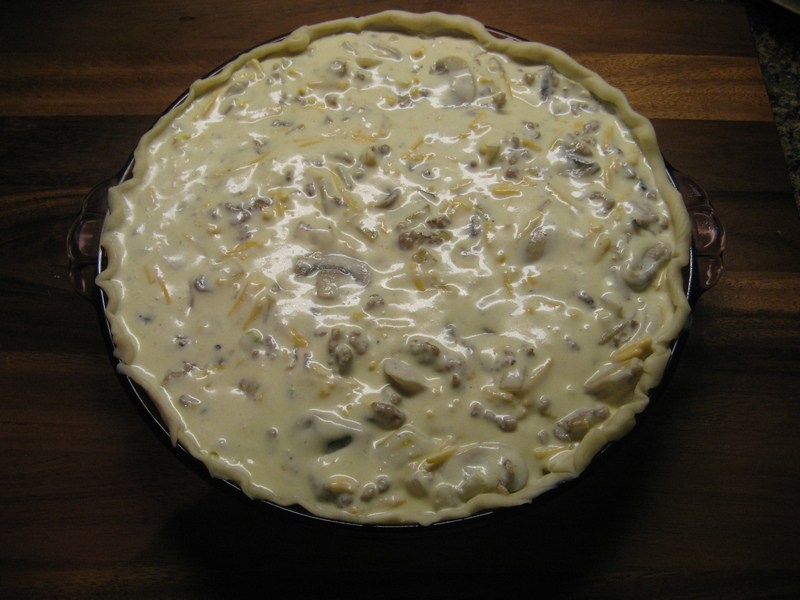 Add the filling, mounding it slightly in the center and dot with the butter. 4. 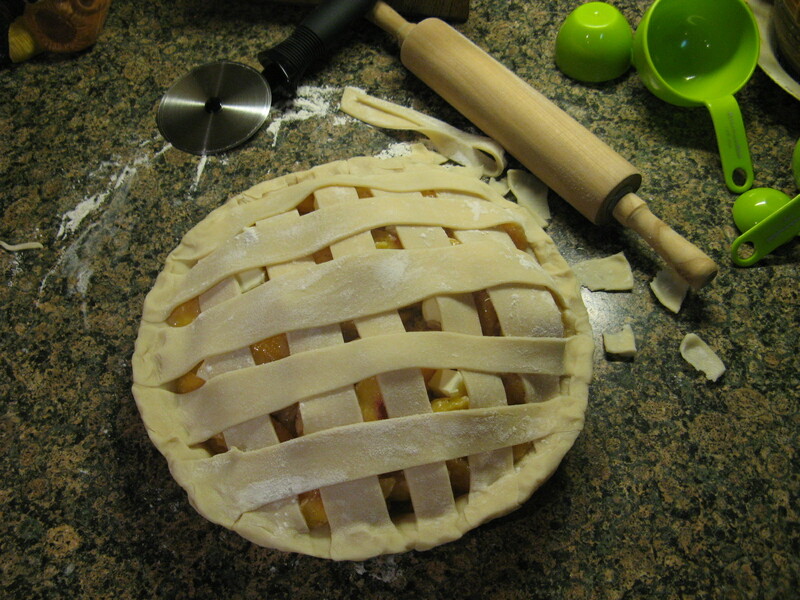 Unroll the second crust and dust it lightly with flour and cut it into 1/2-inch wide strips. Lay half of the strips on the pie in one direction, leaving about a 1-inch space between each strip. Lay the remaining strips on top, crossing them diagonally to make a faux lattice pattern. 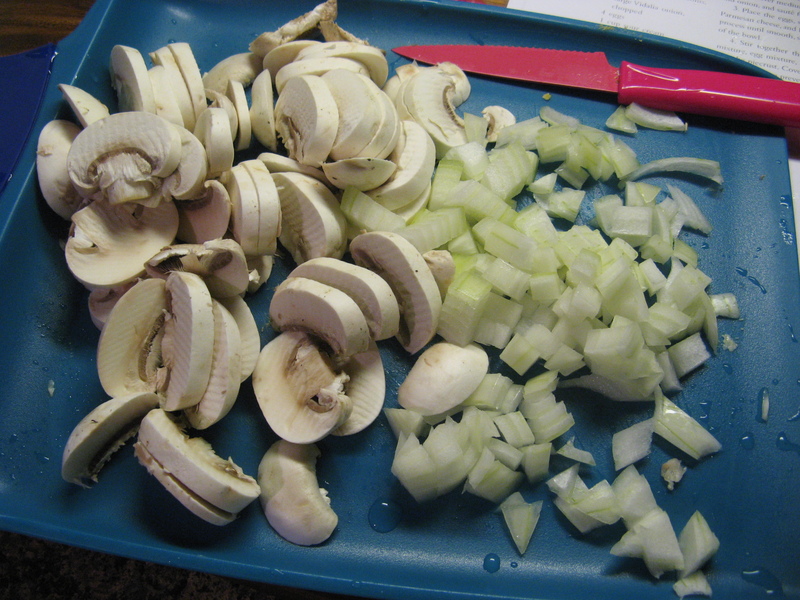 Trim the edges of the strips leaving a small overhang and crimp the edges into the bottom crust with your fingers. 5. Place the pie on a baking sheet and place it in the oven for 20 minutes. 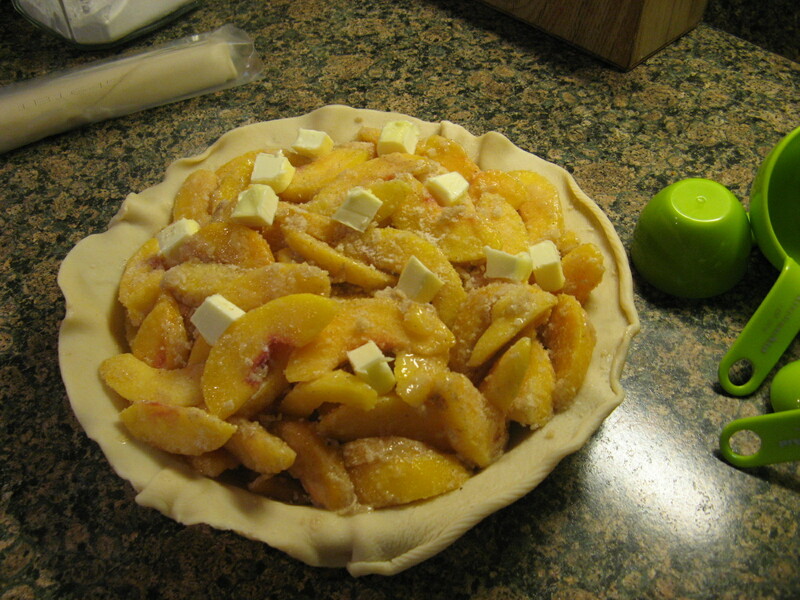 Lower the temperature of the oven to 375 F and brush the pie with an egg wash (beat the egg with a tablespoon of water). Bake for another hour until the filling it bubbly. 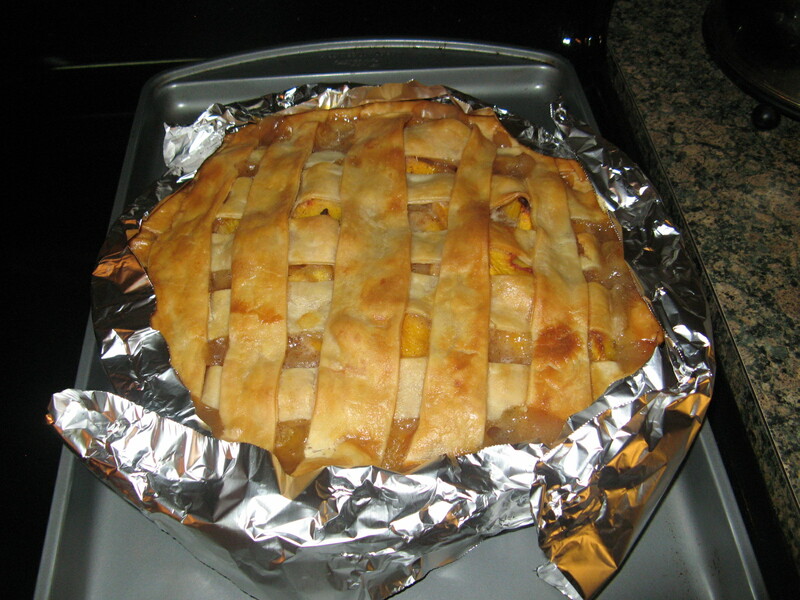 If you notice the out crusts of the pie is browning too quickly cover it loosely with aluminum foil. Once baked, transfer to a rack to cool completely before slicing. Store remaining pie in the refrigerator. Happy Pi Day! What can I say; I am a bit of a math geek. It was my favorite subject throughout school and I was a Mathematics/Economics major in college. I sometimes think that my love of math is what drives some of my hobbies. Take baking; it’s not like cooking where a pinch of this and that can turn out something great. If an ingredient is slightly off when you bake you may end up with something completely inedible. When you are knitting or crocheting (especially knitting) being off with your count can completely mess up whatever you are making and with beading and jewelry making symmetry is key and adding one extra bead, stone or whatever can completely throw off the aesthetics of the final product. But, back to Pi Day… We celebrate it on this day (March 14th) since the first three numbers of Pi are 3.14. Some other things to note about this lovely number… It’s irrational (meaning it cannot be written as a ratio,) it’s never ending (3.14159…) and the decimal never repeats. 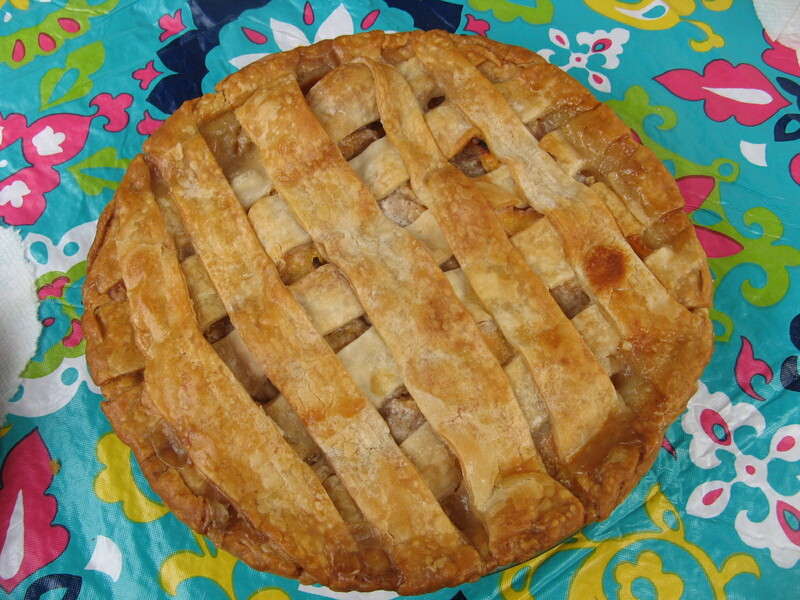 So, in honor of this day I decided to bake a pie – how original!?!? – not just any pie though a pie I have never actually tried before – a Banana Cream Pie. I thought about making this pie a few weeks ago when I had a few ripe bananas staring at me in my kitchen, but then they got eaten so I decided to save the pie for today. So, I had every intention of making my pie crust from scratch, well, let me clarify, I did make one from scratch and although I followed the directions exactly after baking it for slightly less time that directed it still came out a bit overcooked so I just opted to go with a store bought crust and baked it according to the directions on the package. Unfortunately my edge was a little uneven but I knew that wouldn’t take away from the taste. 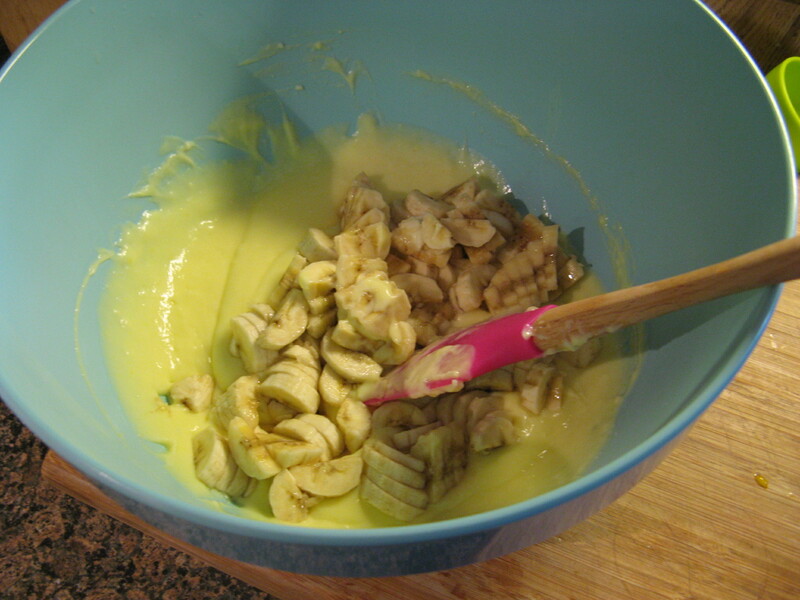 While the crust was cooling I began making the banana cream filling. To begin I prepped those ingredients that needed a bit of prepping: slicing three bananas, separating four eggs for the yolks and cutting up 2 tbsp. of butter. In a medium saucepan I combined sugar, cornstarch and salt and then whisked in milk. I cooked this over medium-high heat, stirring constantly, until the mixture was thick and bubbling. I then whisked the milk mixture in with the eggs yolks. After the milk and eggs were completely incorporated I returned the mixture to the saucepan and cooked it over medium heat once again stirring it constantly until it boiled. 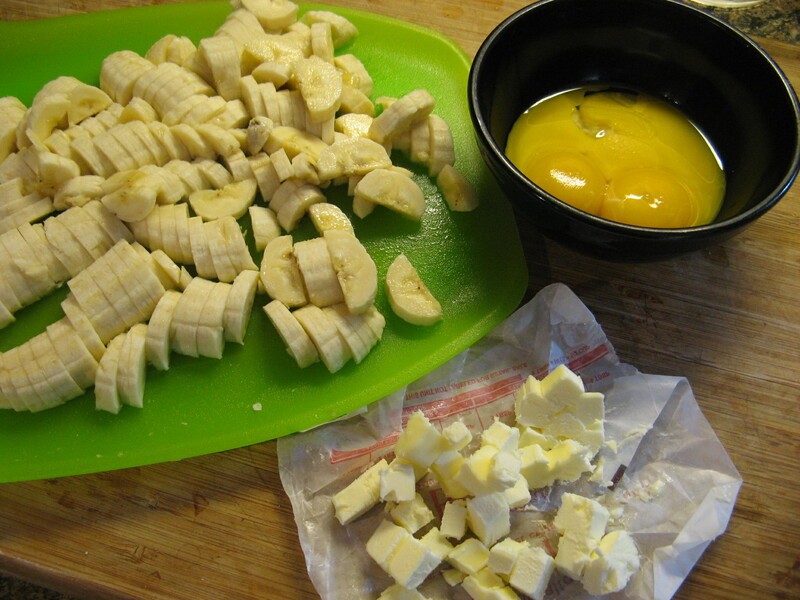 And then mixed in the butter and once it was melted I folded in the bananas. 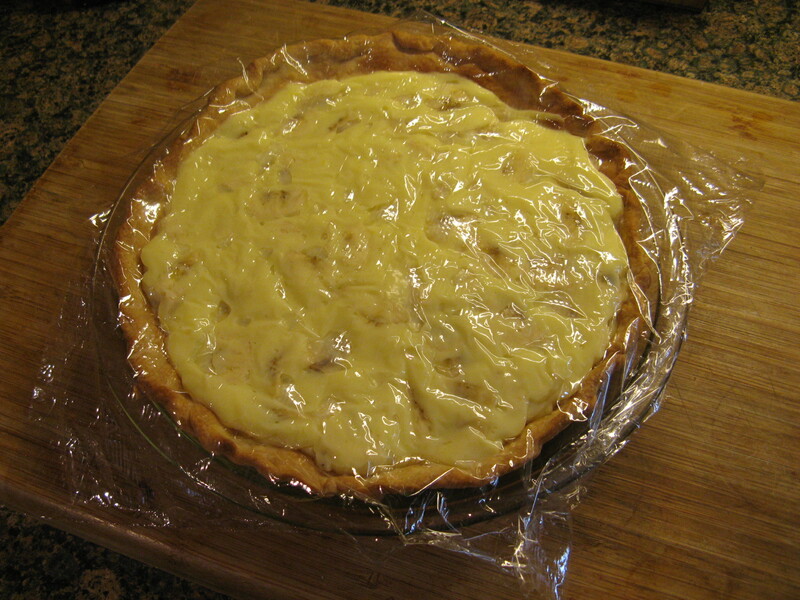 It was then time to pour the banana cream into the cooled pie crust and then cover it with plastic wrap and refrigerate it until the cream was set. 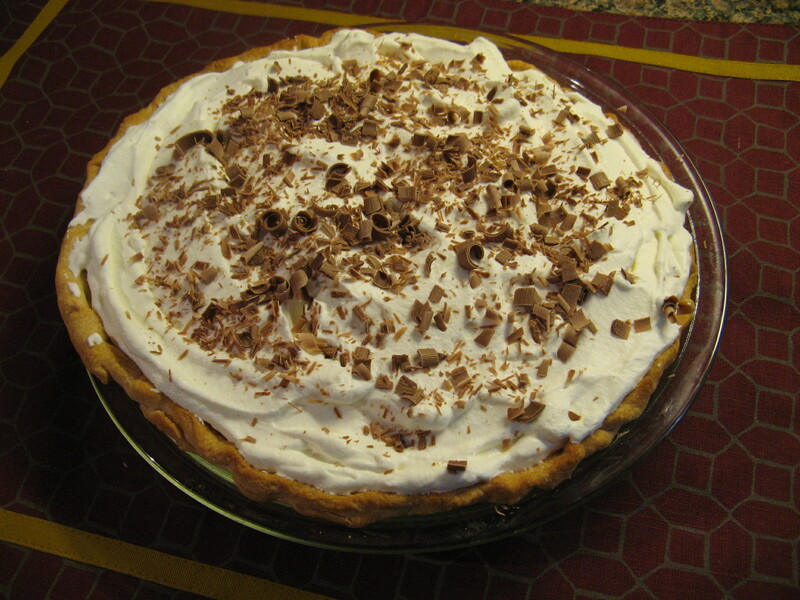 Once the pie was set I made a whipped cream topping for it and sprinkled it with shaved chocolate curls. 1. Make the crust: Preheat oven to 425 degrees. On a lightly floured work surface, roll out dough into a 14-inch round (1/4 inch thick). 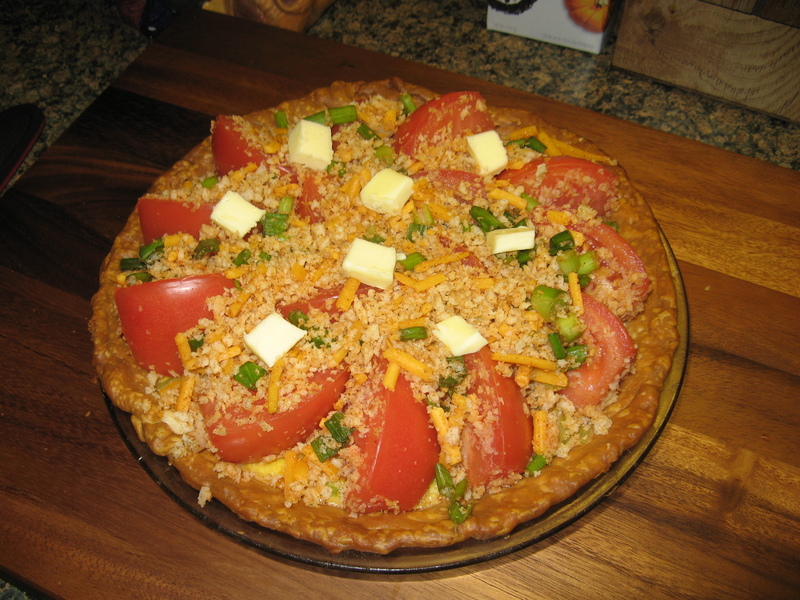 Fit dough into a 9-inch pie plate. 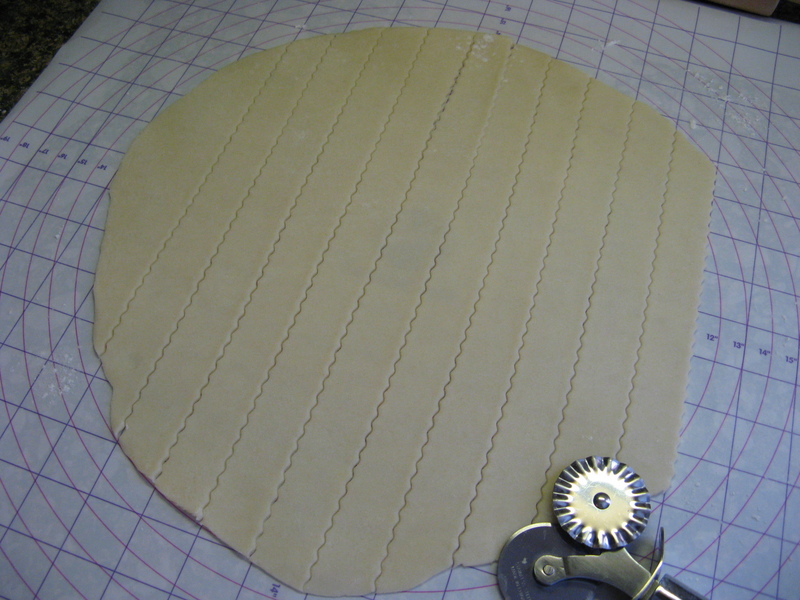 Trim dough to extend above edges by 1 inch, fold under, and crimp. Prick bottom with a fork, and freeze until firm, about 15 minutes. 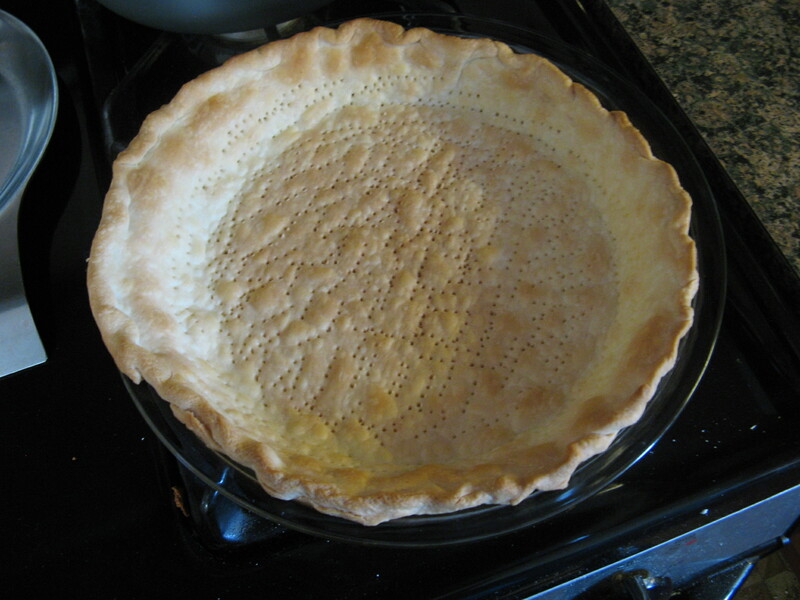 Cut a large round of parchment paper (about 11 inches), and place in pie shell, allowing excess to extend above edges. Fill with pie weights. Freeze until cold, about 10 minutes. 2. Bake crust 15 minutes. Reduce oven temperature to 375 degrees. 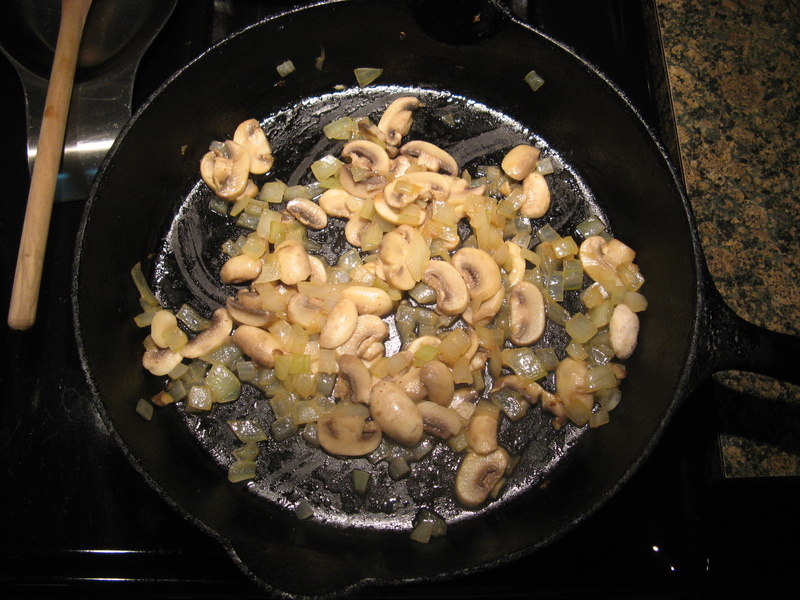 Remove pie weights and parchment, and bake until golden brown, about 20 minutes more. Let cool on a wire rack. 3. 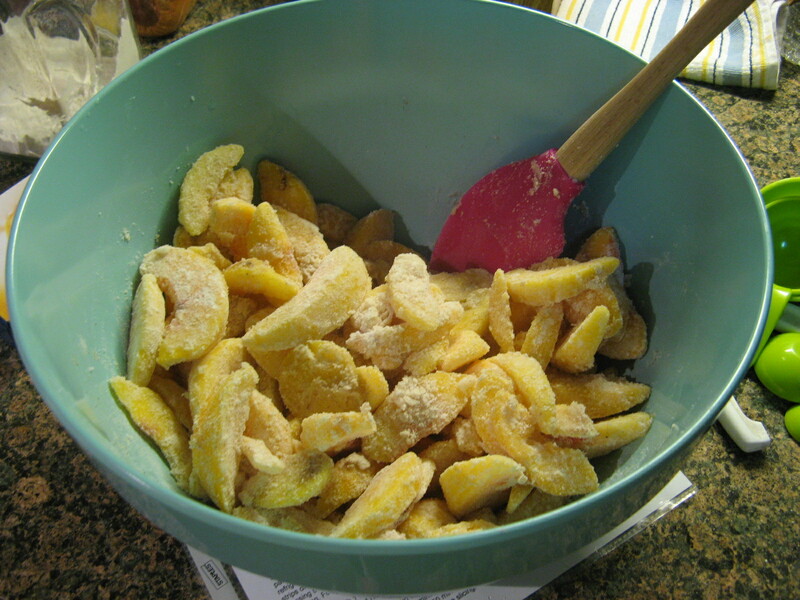 Make the filling: Combine granulated sugar, cornstarch, and salt in a bowl. 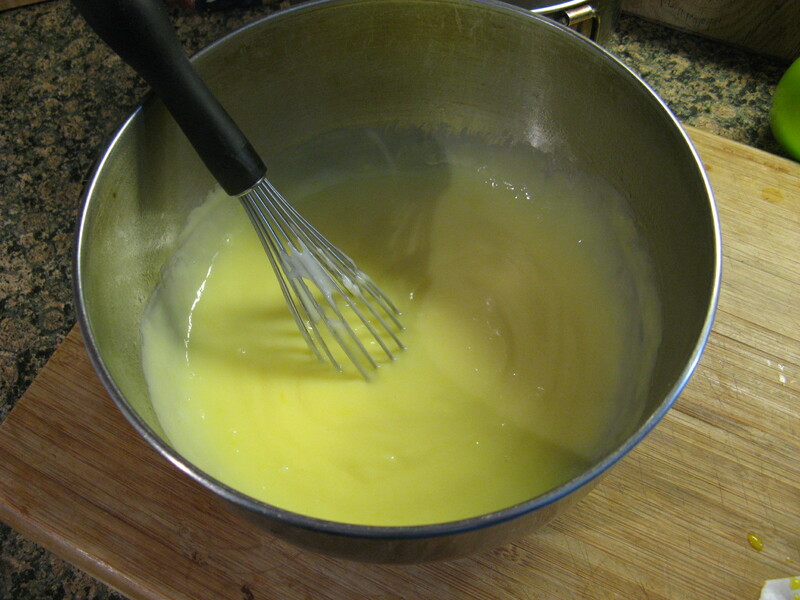 Add egg yolks, and whisk until smooth. 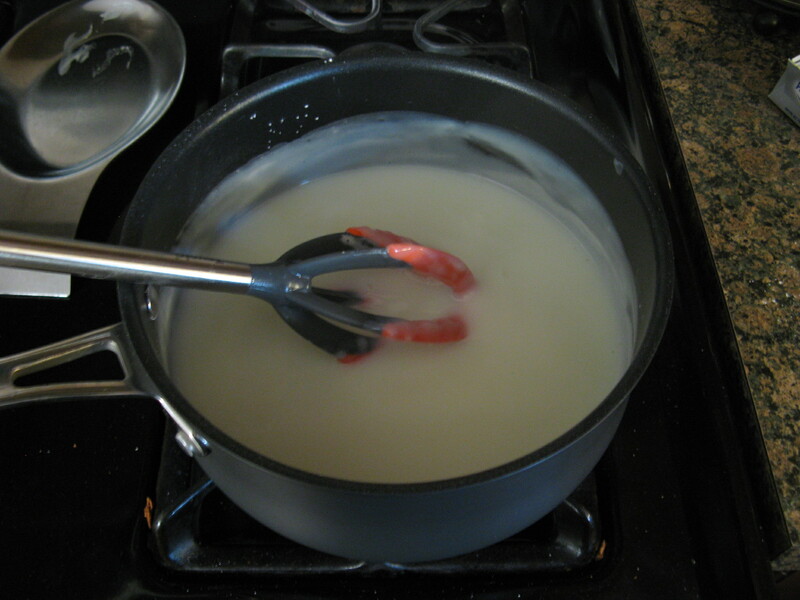 Bring milk to a simmer in a saucepan over medium heat. 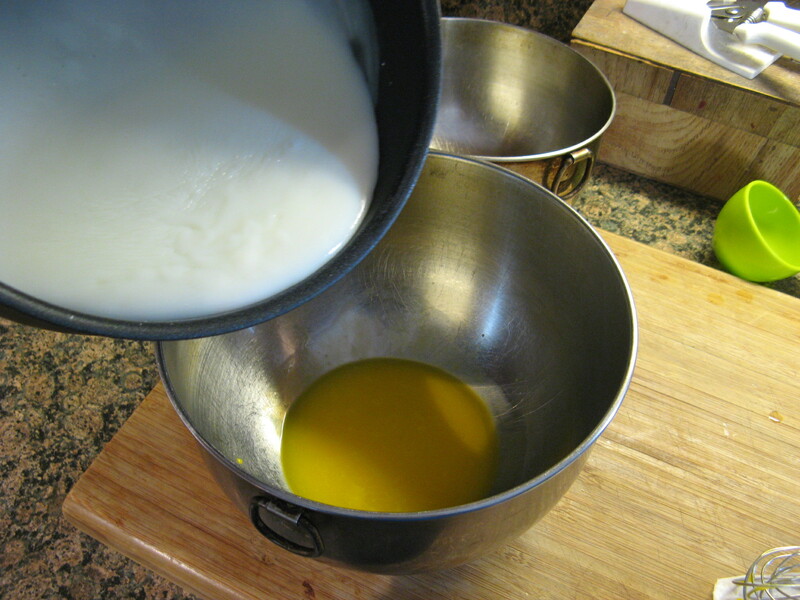 Add 1/2 cup milk to yolk mixture in a slow, steady stream, whisking constantly. 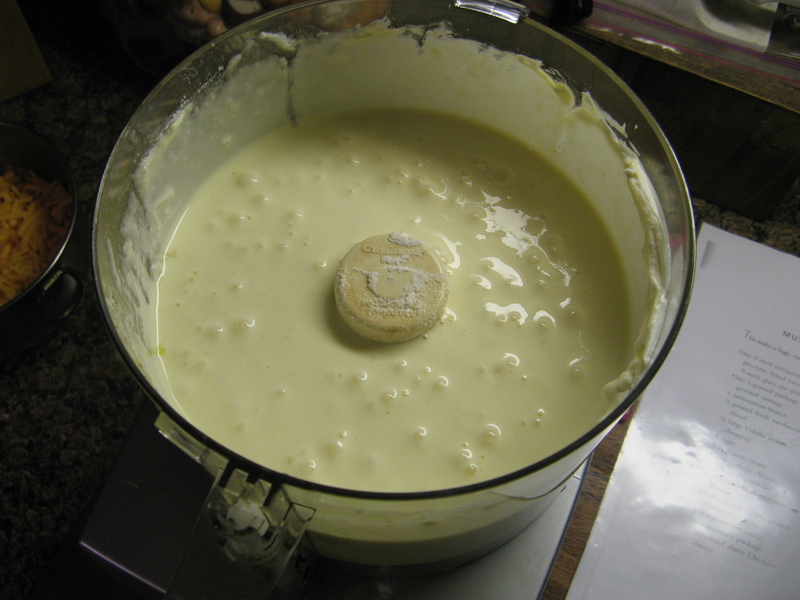 Pour mixture into pan with hot milk, and cook, whisking constantly, until mixture begins to bubble and is very thick, about 6 minutes. 4. 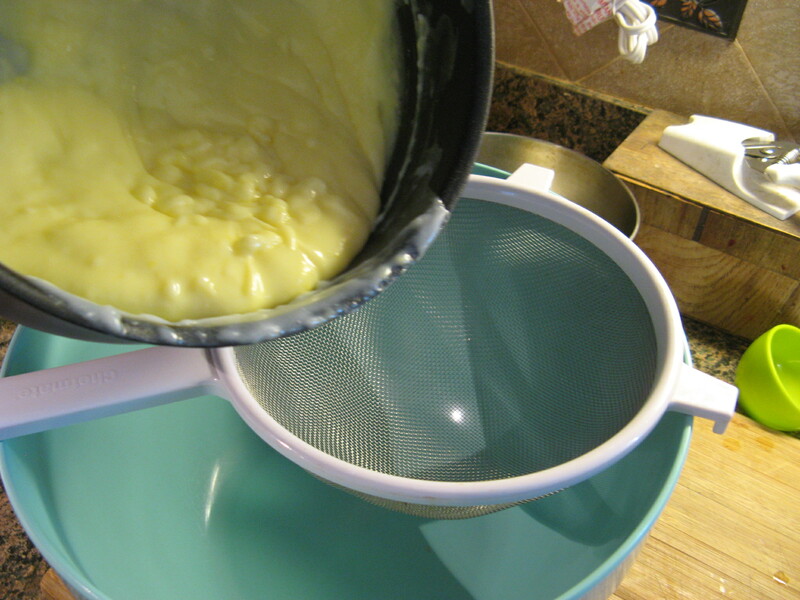 Pour milk mixture through a large-mesh sieve into a bowl. Add butter, and stir until melted. Fold in bananas. Pour into crust. Place plastic wrap directly on surface of filling to prevent a skin from forming. Refrigerate for 2 hours. 5. Make the topping: Beat together cream, sugar, and vanilla until soft peaks form. Spread whipped cream over filling. 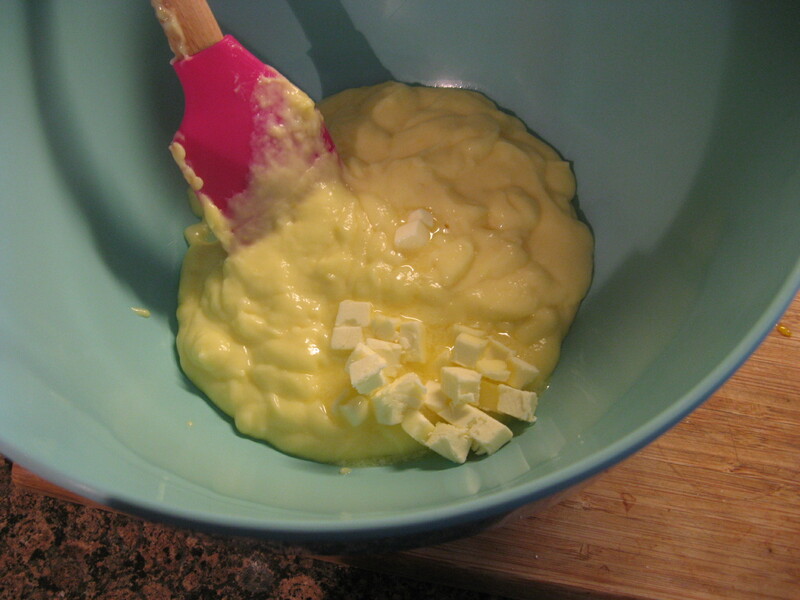 Using a rubber spatula or the back of a spoon, shape topping into peaks. 6. Using a vegetable peeler, shave chocolate at a 45-degree angle, and scatter over pie. (You will only need about 1 ounce of chocolate for the shavings, but it will be easier to shave if you start with a larger piece than you need.) Serve.